Chocolate Covered Strawberries are the perfect treat for Valentine’s Day. 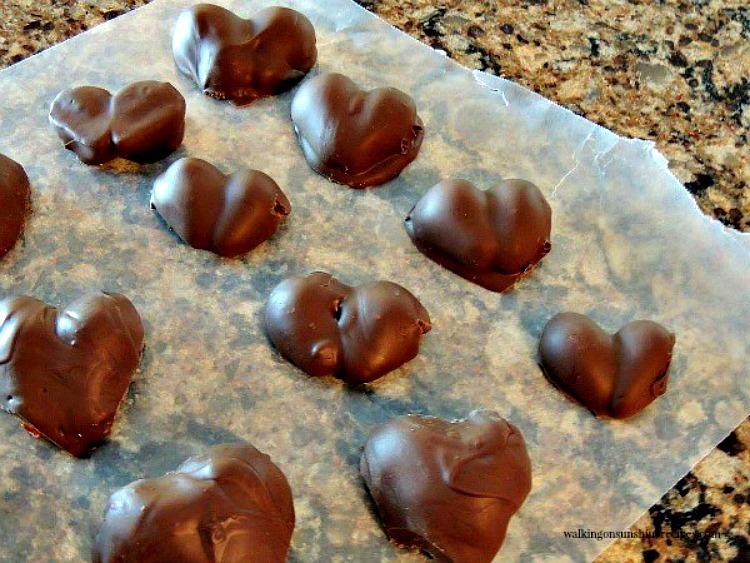 What makes these even better is they’re heart-shaped and so very easy to make. 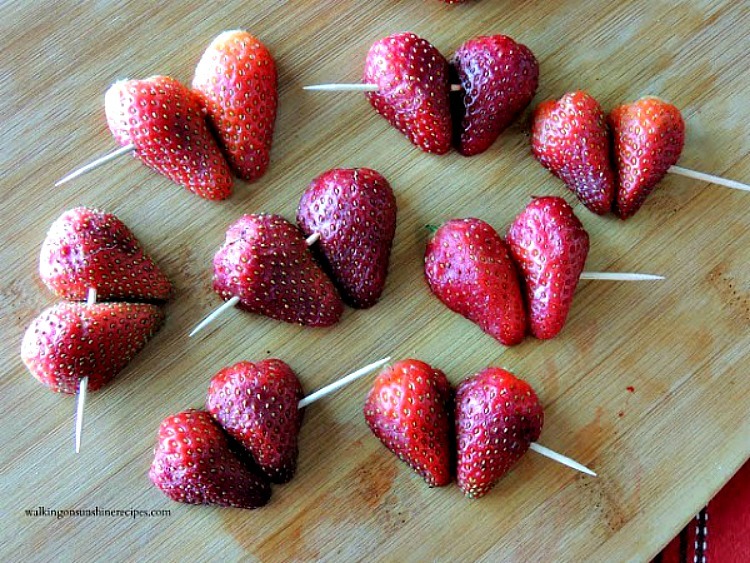 I don’t think you’ll look at strawberries the same again after you see how to form hearts from the strawberry halves. Nothing says I love you for Valentine’s Day more than chocolate covered heart shaped strawberries. That’s right, these strawberries are in the shape of a heart. How cute is this idea? Your family and friends are going to love this treat and don’t worry, they’re really easy to make too…really! Chocolate Covered Strawberries are one of my favorite treats and I love to make them for special occasions. I usually make them every year for Valentine’s Day, but this time I thought, let’s try something different. They’re not only delicious, but so pretty to give as a gift with their heart shape which is exactly what I did. I gave them to my neighbors and they loved them. Toothpicks – okay, technically not an ingredient, but you do need toothpicks to help you create the heart shapes. Once you create the heart shape, you may not be able to look at strawberries the same again. They’re very easy to make. Take the stem off of the strawberries, don’t cut the stem, just pull it off. Then cut the strawberries in half and lay them flat on a cutting board. Place them together with the pointy bottoms touching. Secure them with a toothpick and you have a heart. It only takes a few minutes to have a bunch put together. Try not to put the toothpick all the way through so you have something to hold on to while you dip the strawberries in the chocolate. Follow the instructions on the back of the chocolate almond bark package and melt a few squares. Make sure the strawberries are completely dry by wiping them down with a paper towel before dipping. 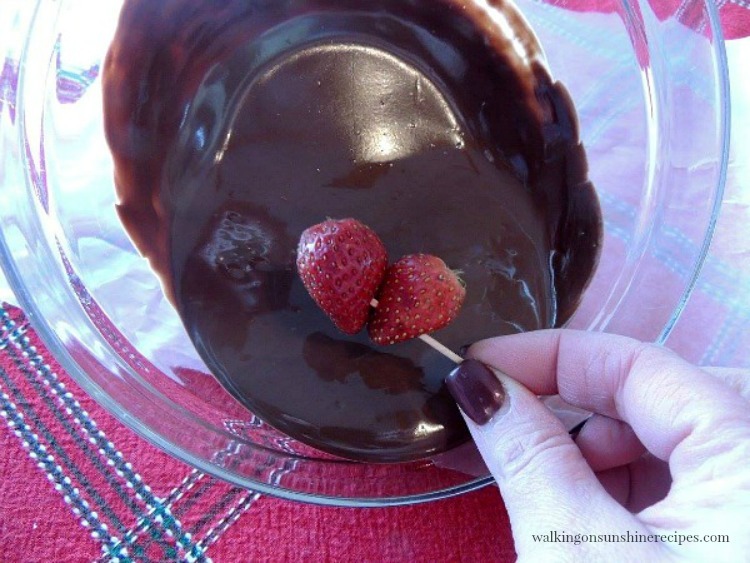 Dip the strawberries in the melted chocolate, trying to get the whole strawberry covered. 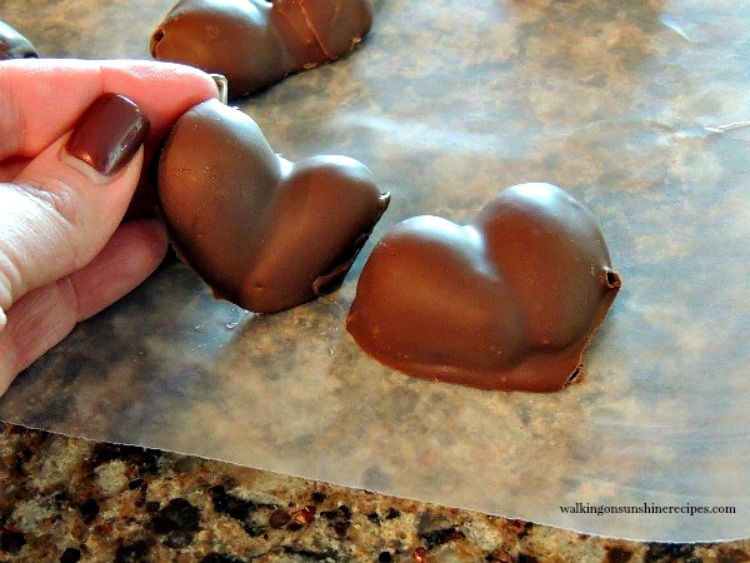 Once they’re dipped, they begin to look like hearts. 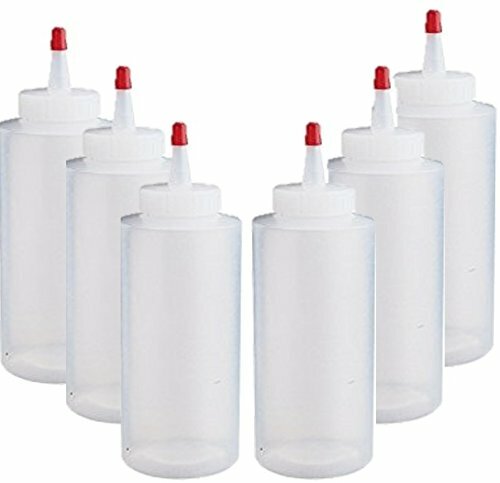 Set them on a piece of wax paper to dry completely. After they’ve dried, you may need to trim some of the melted chocolate away. 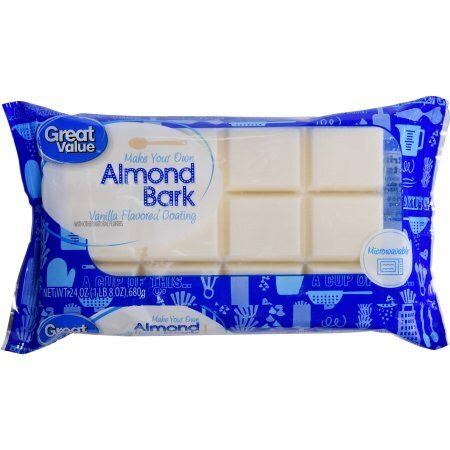 Now melt 2 to 4 squares of the white chocolate almond bark also in the microwave. 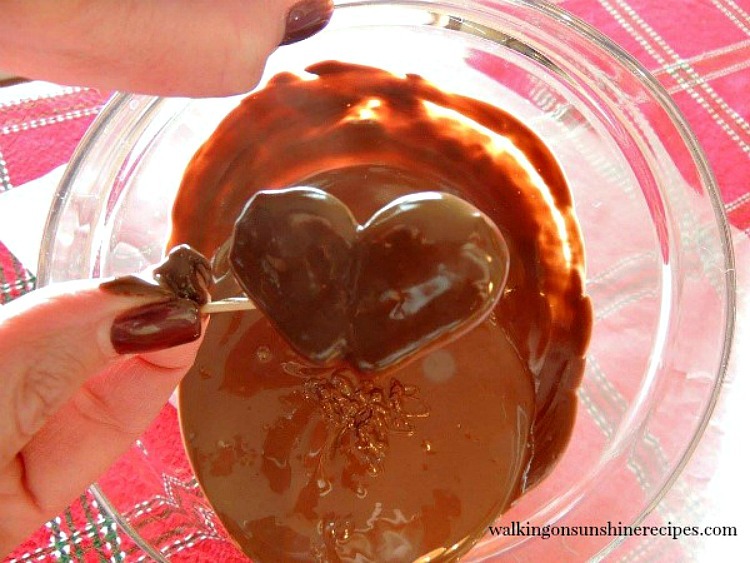 Add the melted chocolate to a plastic squeeze bottle and drizzle on top of the hearts. Make sure you leave some of the toothpicks sticking out of the strawberries to create a handle that will help you when dipping the strawberries into the chocolate. Just before dipping the strawberries wipe them off with a paper towel to make sure they’re as dry as can be. Melted chocolate and water do not mix well at all. Lay the freshly dipped strawberries on waxed paper so they won’t stick. 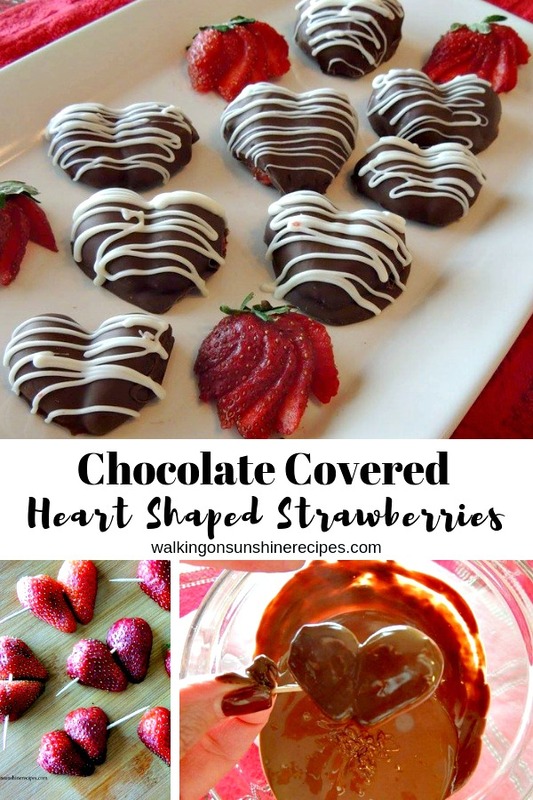 Chocolate Covered Heart Shaped Strawberries are the perfect desserts for Valentine's Day or any special occasion you want something sweet and pretty! Cut the strawberries in half and lay them flat on a cutting board. Place them together with the pointy bottoms touching. Melt the chocolate almond bark in the microwave according to the instructions on back of the package. Holding one end of the toothpick, carefully dip the strawberries in the melted chocolate, trying to get the whole strawberry covered. 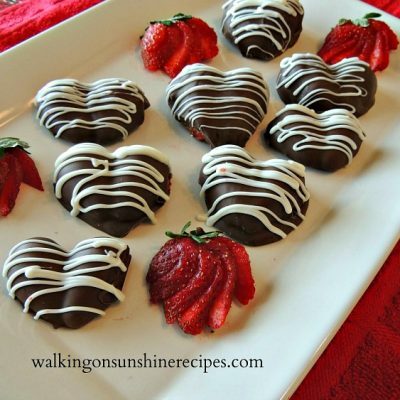 After the strawberries have dried completely, melt the white chocolate and drizzle on top of the hearts. Cook Time includes up to 2 hours drying/chilling time. 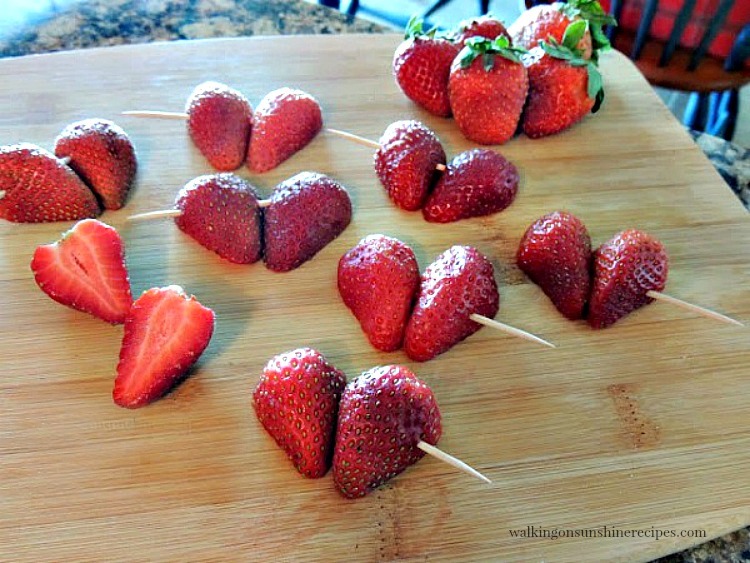 If you like my heart shaped strawberries, you’ll love these other Heart Shaped Treats. Thanks for the invitation. I joined! Oh my I had no idea when I saw the picture over at the Fancy This Friday Party that these were chocolate coated strawberries! I thought they were handmade chocolates. I'm loving this idea and just might give it a whirl for hubby on Valentine's Day along with the sugar cookies I'm making him. Thanks for the inspiration! Thanks for coming over Marie! What a sweet idea!! Do you let them dry with the toothpick in, or do you remove it right after dipping? I waited until they dried completely before removing the toothpick. Thanks Blondee! Hi Lois, This is so terrific. 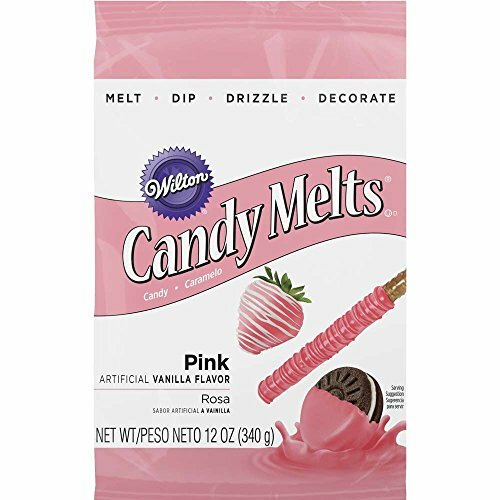 You did a great job – what a great Valentine 'Sweet Treat'. My sister is getting married on valentines and wanted chocolate dipped strawberries. This is a wonderful idea. Thank you for sharing! 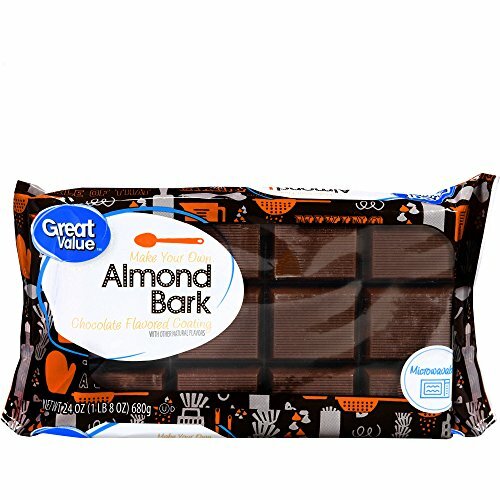 Has anyone tried these using chocolate chips instead of almond bark? G'day! LOVE this Lois! GREAT photos too! This is a great idea! Thanks for sharing on Foodie Friends Friday! Very clever, very cute and creative idea! This is such a cute idea, especially with Valentine's Day coming up! Thanks for sharing! WOW! These are gorgeous. Who wouldn't want to eat these delicious beauties on Valentine's Day? Thanks for sharing at Making Monday. Have a great week. Ooh, those sound totally amazing!!! Pinning, and I featured this today on my blog! Hi, Lois! 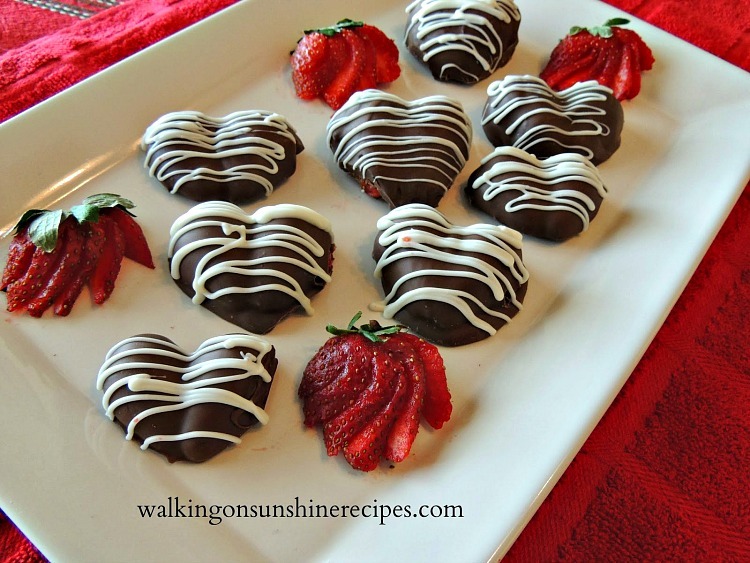 These strawberries are so cute – I love the idea of making them into hearts 🙂 Just dropping by to thank you for linking up to Freedom Fridays and to let you know that we'll be featuring you tonight – you can grab a button if you'd like one! We can't wait to see what you share this week! Hugs!! This is awesome, love how creative it is! Thanks for sharing on the weekend re-Treat link party. What a fun twist on traditional chocolate covered strawberries! Yum! 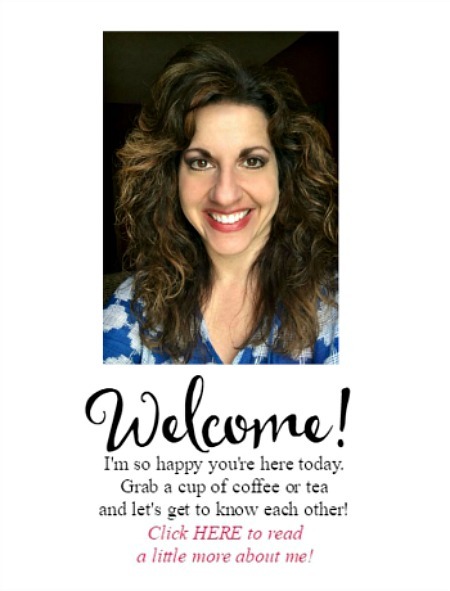 Would love for you to share at Fridays Unfolded! You clever lady!! 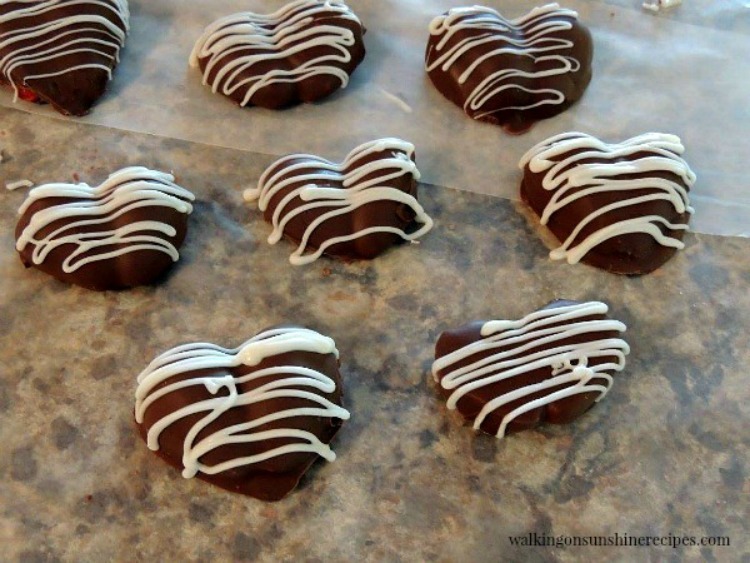 I am loving these heart shaped chocolate covered strawberries:) One of the reasons we featured this at Freedom Fridays With All My Bloggy Friends!! I love chocolate covered strawberries. It's so cute that these are heart-shaped! Thanks for linking to the In and Out of the Kitchen Link Party. Hope to see you next week. I totally love these. I think I'll turn them into lady bugs for my daughter's birthday. Thanks for sharing at Simple Supper. What a smart and delicious idea! They look so pretty! Was it hard to remove the toothpicks without cracking the chocolate? What a clever idea – so pretty! what a great idea! will definitely have to try it! You make it look so easy. Thanks for sharing on the #HomeMattersParty I hope you will join us again next week. Who doesn't love chocolate covered strawberries! And they're shaped like a heart for valentines day, I love it!! This is adorably brilliant! Thanks for sharing! 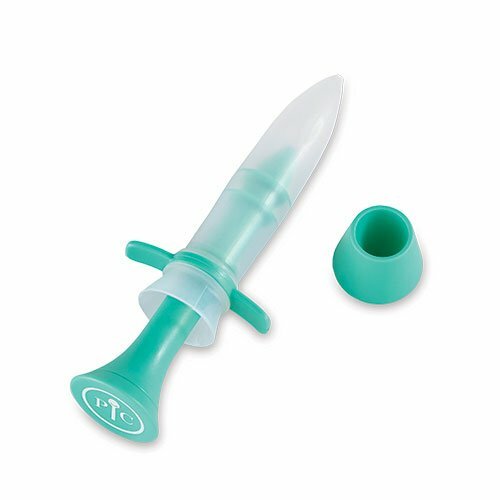 I never would have thought of this! 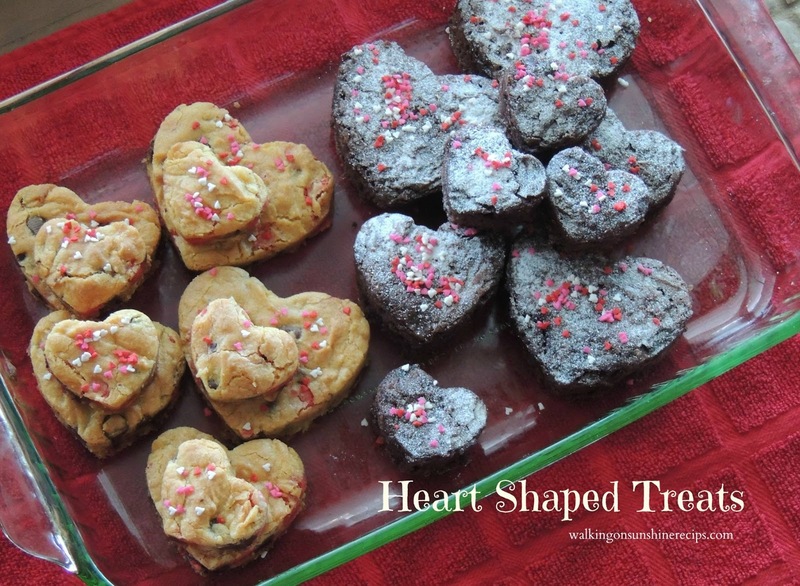 I am making these for Valentine's this year and thank you for the creative isea! I've always thought strawberries whee shaped like heartsso this really caught my heart! So SMART!!! They are adorable (and delicious!) hearts 🙂 Thanks for sharing at “Sweet Inspiration”!